The Taiwanese breakfast is something to behold, they really push the boat out on all fronts. Between 06:00 and 11:00, I challenge you to walk more than 250m down any main street in Taipei without stumbling across a breakfast shop. But, without speaking Chinese, you could be faced with a problem. What do you order? What is that dish you just pointed at and said “1” gingerly? Guide: Chinese tones are difficult, but go slowly and pronounce them word by word. The shop owner will not mind! This is a flat high tone, like saying eeee . This is one that will go up like how an Australian speaks in almost every single sentence. But, seriously, try going up in the second half of the word. This is the tone that dips down, and comes back up, like an inverted mountain. Try saying the first half of the word by going down, and the second half of the word rise the tone up a bit. This is why everyone thinks Chinese is an angry language and that everyone is always arguing. This tone only goes down. Be angry with it! In all honesty, I am not a huge fan of this. But, some people swear by it. This fried dough stick wrapped in a pastry is filling, cheap (around $40), and tasty. But, I would recommend getting the pastry bread with egg and cheese, instead – 燒餅加起司蛋 shāo bǐng jiā qǐ sī dàn. This is basically a cheesey omelet inside a crunchy pastry – win. Arguably more Cantonese than traditionally Taiwanese, fried radish cake is a breakfast staple served up all over the island. Radish is mixed with some meat and flour, then pressed into a ‘brick’. Slices are fried up with an egg and served with a thick soy sauce or spicy chilli sauce. TimHoWan near Taipei Main Station does an awesome radish cake, as does World Soy Milk King in YongHe, and the one pictured is from Delisoys in the Eastern Area near ZhongXiao FuXing MRT station. This is my go-to snack whenever I am in the area, with lashings of chilli sauce. 鮪魚蛋餅 wěi yú dàn bǐng. Loco food does a brilliant egg pancake stuffed with tuna and sweetcorn. The outside is really crispy and the inside still a little soft. But, really, you can get these at almost any breakfast store. I enjoy mine with lots of chili sauce, washed down with an ice-cold soy milk. Also, Laya burger does a good wholemeal one that’s chewier than most others, with a variety of different fillings you can add. Notice a theme, here? 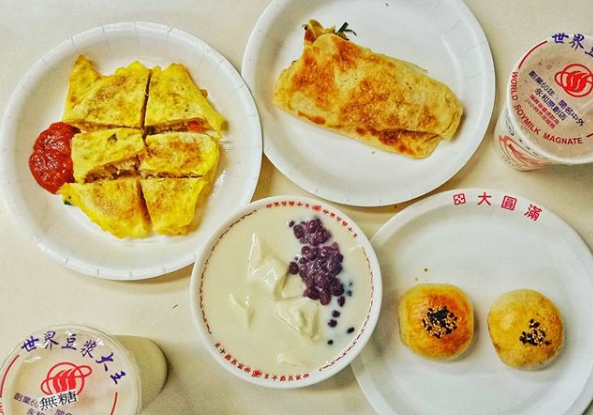 Taiwanese breakfasts are heavy on those stodgy goodies that we all hate to love! The rice wrap/ball is no different. Different in almost every place you go to, a simple pad of rice is stuffed with goodness and either rolled into a ball or a sausage-like shape. You can go sweet or savoury, either way, I am confident that you won’t be disappointed. There’s a very popular rice wrap stall at Ning Xia nightmarket but I found it lacking in flavour. This one from Delisoys do a good pork floss and dough stick one, and some places will offer up both savoury, and also sweet ones. I really like Delisoys ‘healthy’ fried dough stick, paired with this sugar-free soy milk. A Taiwanese tradition is to dunk the dough stick into the soy milk, or even into an almond milk. Both are delicious, and I strongly recommend you to try it!